Rejane Cantoni and Leonardo Crescenti are the creative brains behind the kinetic installation WALL, which is currently on display in Berlin and will move to Linz in a couple of weeks. During the preparations for “Like A Second Nature”, there was time for a chat. How did you come up with the concept for work? To develop and implement audio-visual-tactile interfaces or, if you prefer, immersive and interactive installations that produce images, sounds, smells and haptic sensations in function of the choices of the visitors we use methods, strategies and input coming from all areas of knowledge. In general supports, theories, languages, materials and teams are defined in function of the problem to be confronted. In this process the key questions are: what is the idea? Where will it be implemented, in what space? What is the execution time? How long is the exposition? Who will use it? Who are the interlocutors? Has anyone ever done this before? Has anyone tried to do it? What are the available funds? Among others. What were the biggest challenges in realizing the project? The central challenge of our research (including WALL) is to develop and implement devices that make it possible to stimulate different multi-sensorial mechanisms of interaction and immersion. The emphasis is in transforming aspects of complexity from the physical world, from the sign world and/or from hybrid environments in sensory information that anyone could understand. This means to design and develop devices capable of making it possible for the visitor to experience, perceive and understand, naturally and intuitively, ideas, theories, sensations and/or physical phenomena. It means researching, developing and implementing audio-visual-tactile interfaces centered on the “human being”, interfaces that consider the perceptive and cognitive capacities of the interactor in the face of situations which demand or reflect adjustments in the perception and behavior, such as, for example, time, space, energies, human-human, human-machine or machine-machine communication systems. The research began in 2005. In that year we began dating and we thought it would be interesting to unite our experiences and backgrounds to together speculate about new modes of kinematic interfaces. The WALL Project is one of the possible outputs of this speculation. In this case the idea was to develop a device which would make it possible to observe how a body or an object provokes alterations in space – i.e. what happens when we enter a room? Does our presence transform the environment? Does the environment transform us? What is your goal, what are your intentions with WALL? WALL is a kinetic, interactive sculpture made of 30 aluminum plaques which, in sequence, rotate 180º. The effect of the sequence occurs in function of the actions of the pedestrians on the space. As in the game of Domino, the passing of the interactor on one of the extremities of the installation starts up a movement mechanism; the plaques gyrate, one at a time until they are all rotating. The action of the plaques rotating in sequence, besides suggesting the idea that one effect is the cause of the other, produces a series of kinetic optic happenings for the one who is passing by similar to: de-materialization of architecture; transformation of the building into the surrounding landscape; other variations caused by the transformation of light and the climate; transmission of information. How did you end up being an interactive creator/artist, where do you come from? 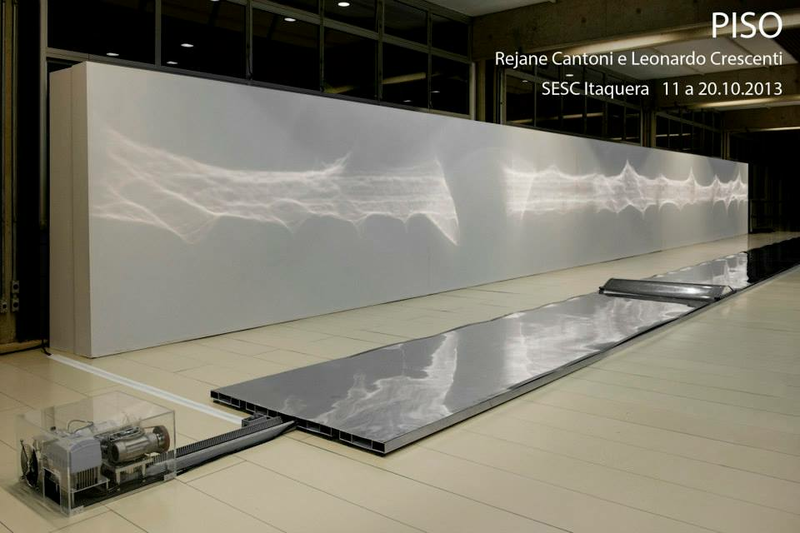 Rejane Cantoni studied Communication, Semiotics, Visualization of Information Systems and Kinematic Interfaces, in São Paulo and in Geneva; since 1987 she has researched and developed immersive installations with devices for the acquisition and manipulation of data in natural and/or sensorized and automated environments. Leonardo Crescenti studied archiutecture at FAU/USP, in São Paulo; since 1978 he has investigated and developed projects in various media and supports. As director, he has realized 13 short films receiving numerous awards and national and international participation, including 3 participation in the Director´s Fortnight in the Cannes Film Festival. Do you already have plans for the future? WALL can be seen until the end of July at the VW Automobil Forum Unter den Linden in Berlin as part of “Like A Second Nature” and will move to Linz after the end of the exhibition.